Oct. 10, 2016 | 1 p.m.
With the advance of the brown marmorated stink bug across the United States, Wisconsin researchers are working to detect when and where their populations will reach nuisance or agricultural pest levels in the state. Traps have been placed to monitor for brown marmorated stink bugs in wooded areas (where the bugs overwinter), in urban areas (where they gather looking to overwinter in houses), in apple orchards, and in vegetable and field crops. Fifty-one traps have been maintained since June 2016 and are being monitored through the end of October. The brown marmorated stink bug is an invasive species of agricultural and urban importance, so it is essential to keep track of its occurrence and expansion in Wisconsin, and to provide an early warning system to help protect crops and prevent home invasions. Indeed, where it is more established on the East Coast and Mid-Atlantic regions, this bug is a major agricultural pest and is found in extremely high numbers inside homes and businesses. Out east, it destroys apples, pumpkins, soybeans and corn, and feeds on many other crops and ornamental plants. The bug has been in Wisconsin for about six years and it is not yet causing problems for farmers, but could in the near future. In fact, brown marmorated stink bug adults were caught in traps in a couple apple orchards and a pumpkin patch in Dane County in early October, making this the first official report of brown marmorated stink bugs on agricultural crops in Wisconsin. Apple, pumpkin, soy and other fruit and vegetable growers should scout for the brown marmorated stink bug by inspecting crops and neighboring vegetation, as well as keeping an eye out in barns and other heated outbuildings. Throughout most of the summer, few brown marmorated stink bugs were caught in the monitoring traps set as part of a research collaboration by the University of Wisconsin-Extension, the Wisconsin Department of Agriculture, Trade and Consumer Protection and the Integrated Pest Management Institute of North America. However, in late September the insects began turning up in urban traps in the Madison area — about five insects per trap per week. Those densities are still low compared to other states out east, but is significant compared to the lack of the bugs all summer. In the summer, they probably fed on ornamentals, as they were observed in Madison on cotoneaster, dogwood and grasses. They may also have taken advantage of homegrown vegetables, but no one reported seeing them in vegetable gardens. 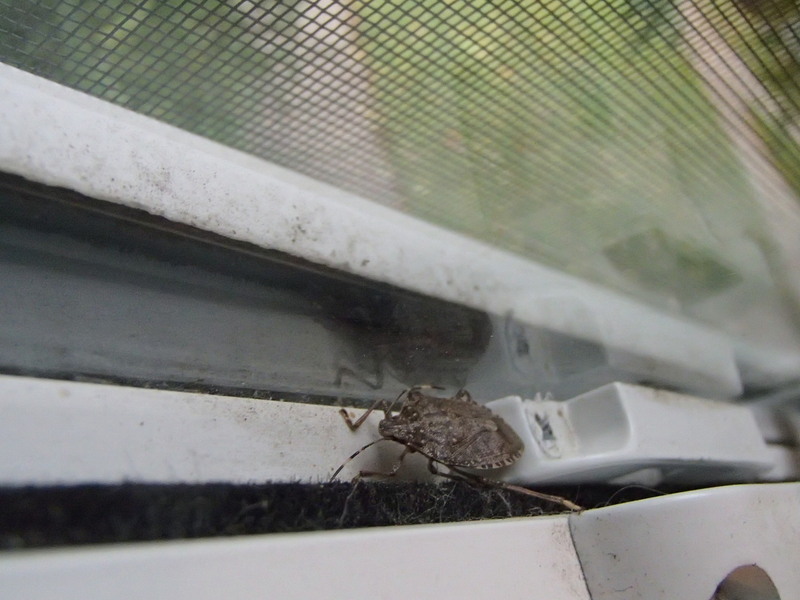 Weather-stripping and caulk can help prevent brown marmorated stink bugs from invading your home via doors and windows. Adults are starting to gather on window screens of houses in an attempt to enter buildings. They are looking for places to spend the winter, such as inside warm houses, and so are moving from their summer feeding habitat to congregate in urban areas. High numbers of brown marmorated stink bugs are not expected to invade Wisconsin houses this winter, but in the mid-Atlantic region of the U.S., the bugs can enter buildings by the hundreds or thousands. Bugs should not be crushed because they will produce a strong offensive smell that can linger for days. Install weather-stripping under and around doors. Put a screen over the top of the chimney. Caulk or otherwise seal cracks around windows, crawlspaces or other potential entry spaces. Knock small numbers of the bugs into a container of soapy water to kill them; vacuum large numbers of bugs inside a house. Brown marmorated stink bugs on crops or inside a house can be identified by the shield-shaped body, which is a half-inch to five-eighths of an inch long, with multiple shades of brown, and with characteristic dark and light bands on its antennae. The University of Wisconsin-Extension published a guide with images. Anyone finding a suspected brown marmorated stink bug can take a picture with a coin in the frame for size reference, and email the photo to janet.vanzoeren@ces.uwex.edu. Christelle Guédot is the fruit crop entomology specialist with the University of Wisconsin-Extension and UW Fruit Program, and an assistant professor in the UW-Madison Department of Entomology. Janet van Zoeren is a fruit crops associate with the University of Wisconsin-Extension. This article is adapted from an item originally published in Wisconsin Fruit News, a publication of the Fruit Crops Team.